I am building a ground pushing and pulling probe similar to the pic attached. 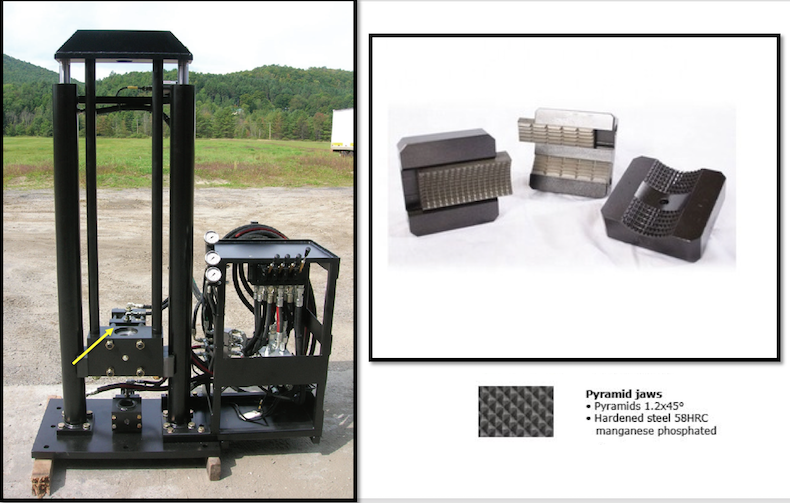 A probe rod is hydraulically clamped and held in place using a split clamp jaws that have a pyramid grip pattern made from hardened tool steel 58HRC similar to the pics. That particular machine (in the picture) can hold up to 200kN of push/pull force. My question is how do I calculate the size and force of the hydraulic cylinder to hold a similar load 200kN? The clamp jaws will be approx. 150mm high and match the dia. of the probe pipe which is 36mm with a hardness of approximately 30-40HRC. The clamp won't quite go the full diameter and will have a little gap at the ends. The pyramid serrations will be as per the pic 1.2 x45deg. Thanks for looking and any suggestions are much appreciated and welcome.